In early antitumor efficacy studies, Nanobacterie researchers used suspensions containing magnetosome chains directly extracted from magnetotactic bacteria. To prepare these suspensions, we did not specifically treat the magnetosome chains, and they were therefore surrounded by biological material (lipids, proteins, endotoxins) originating from magnetotactic bacteria. In a first series of experiments at Nanobacterie, we grew breast cancer tumors (MDA-M231) under the skin of mice. When the size of these tumors reached about 100 mm3, we administered around 1 mg of a suspension of magnetosomes extracted from magnetotactic bacteria to the center of the tumor, which was followed by several applications of an alternating magnetic field of 20-mT strength and a frequency of about 198 kHz. This treatment led to a moderate temperature rise in the tumor (<43°C) and to the complete disappearance of the tumor one month after the beginning of the treatment, showing its efficacy. The figure below describes the treatment protocol used to treat subcutaneous breast cancer tumors, the measured temperature reached during the first heating session, and shows a photograph of a tumor-free healed mouse taken one month after the beginning of treatment. In a second series of Nanobacterie experiments, we grew glioblastomas (U87-luc) in the brains of mice. 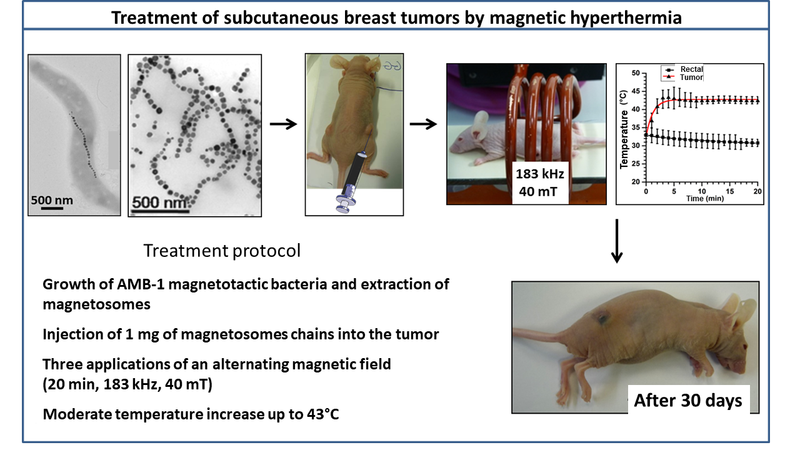 When glioblastomas reached a volume of approximately 1–5 mm3, we introduced 40 μg of a suspension of magnetosomes directly extracted from magnetotactic bacteria to the center of these tumors, and exposed the mice to 15 applications of an alternating magnetic field of 20-mT strength and a frequency of 198 kHz (application sessions S1–S15). The temperature increase in the tumors did not exceed 4°C. The progressive disappearance of the tumor was observed one to two months after the beginning of treatment, and 40% of the mice treated with magnetosomes were cured. The figure below (on the left) shows a mouse treated with a magnetosome injection followed by 15 magnetic field application sessions (S1–S15). The bioluminescence signal, which is proportional to the size of the tumor, disappeared 42 days after the beginning of the treatment. The figure (on the right) shows survival rates for mice treated with equal quantities of either magnetosomes or nanoparticles. 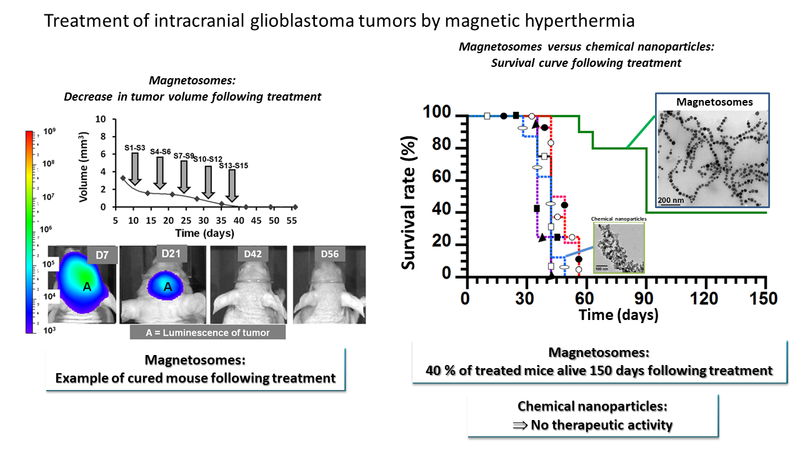 This shows that 40% of mice treated with magnetosomes were still alive 90 days after the beginning of the treatment, while all mice treated with chemical nanoparticles died within 50 days of the start of treatment. 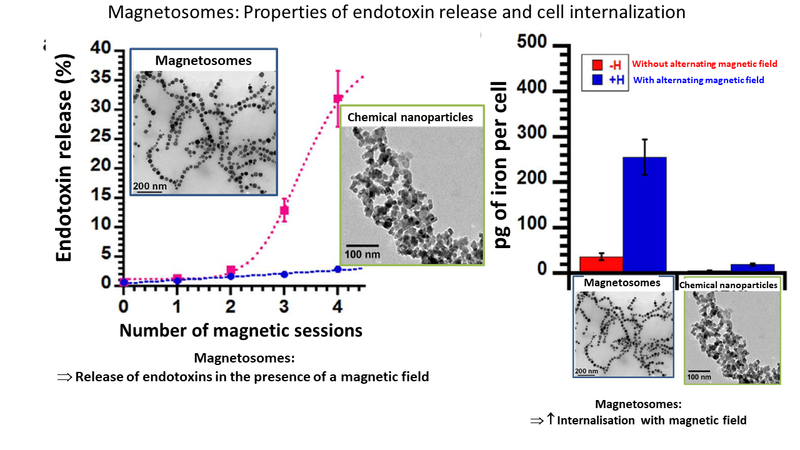 To explain the origin of the antitumor activity, we measured the percentages of endotoxins released following treatment with nanoparticles after one or more sessions and the quantity of nanoparticles internalized in the tumor cells following application of the magnetic field, in solution and in vitro, respectively. internalization in tumor cells, which may facilitate their destruction.